This CellML model is known to run in OpenCell and COR and can recreate the published results. The units have been checked and are consistent. ABSTRACT: We propose a mathematical model for the regulation system of the secretion of glucocorticoids and determined the coefficients in the system of ordinary differential equations. Some results are calculated which agree with the experimental results. A mathematical model of the regulation system of the secretion of glucocorticoids, Liu Bingzheng, Zhao Zhenye and Chen Liansong, 1990, Journal of Biological Physics, volume 17, issue 4, 221-233. The HPA axis model has three compartments, namely the hypothalamus, pituitary and adrenals. Neural signals trigger CRF secretion by the hypothalamus. In turn, this signals to the pituitary to release ACTH which stimulates the adrenal gland to release cortisol. 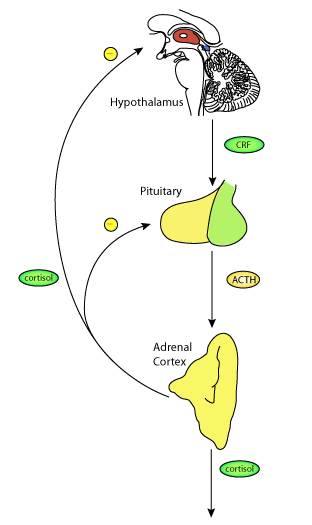 Cortisol acts on the hypothalamus and the pituitary to have a negative feedback effect on the release of CRH and ACTH respectively. Derived from workspace Bingzheng, Zhenye, Liansong, 1990 at changeset a3029e18f8b8.